Benefits of chia seeds. Among nutrient rich foods, nuts and certain seeds have always stolen the limelight. Chia seeds are a super hit when it comes to health benefits. Once you read the enormous health benefits of Chia seeds on health, it will be hard to keep it away from your next shopping list. Before we see the benefits of chia seeds, let us first take an insight on its Nutrient content. How to buy Chia seeds? Chia seeds have numerous health benefits. Like the saying goes, “All good things come in small packages”, Chia seeds are the best example to live by it. Let’s see the benefits of chia seeds one by one. Chia seeds help in weight loss by increasing metabolism. Chia seeds when taken as a pre workout snack will help in increasing your stamina to burn out more calories and stretch your workout timings. Chia seeds are full of fiber and help by satisfying your hunger. Making you feel full. Chia seeds can be very helpful in ladies with Pcod and Pcos problem. Chia seeds help against bloating. Chia seeds have a tendency to absorb a lot of water and swell up , this helps in slowing down the digestion process and hence slow release of sugar in the blood. This helps a type 2 diabetic person to manage his blood sugar levels well. This will help in keeping you full for longer and hence avoid overeating. Chia seeds are super sources of calcium and all the other minerals that are important for bone and teeth health. Chia seeds actually contain more calcium than dairy products. For people who do not consume dairies, chia seed comes as a blessing in disguise. Several studies are being conducted on effects of chia seeds on heart health. 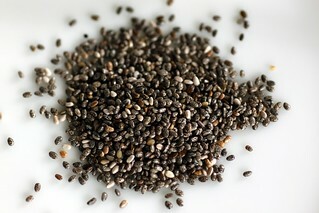 A study at Cleveland suggested that chia seeds improve blood pressure levels in type II diabetics. The study also suggested that chia seeds have a positive effect on other markers of heart health. It improves the HDL cholesterol (good cholesterol), and decreases the bad cholesterol and triglyceride levels in blood of a type II diabetic. There are certain studies that have not been very conclusive of benefits of chia seeds on heart health. Chia seeds are good source of fiber, omega 3 and protein and they definitely are the best choice of food for your heart’s health. We all know that proteins are the building blocks of our bodies and proteins have such important functions that are crucial for life processes. Chia seeds are protein by 14 % of their weight. This helps chia seeds to be counted as a super food for weight loss. It not only reduces appetite and makes you feel fuller for longer, but it also suppresses hunger. Wow! These features are just what a weight watcher desires. Chia seeds hence make a super snack especially in the evenings when one tends to feel hungry and over eat snacks. The department of food and nutrition of Purdue University in Indiana conducted a study on Chia seeds in 2008 and found than chia seeds contain a very good amount of antioxidants. Quercitin – Quercitin has endurance increasing properties. It gives an instant boost of energy for physical training. It also helps in fighting fatigue during workout, thus increasing the stamina. Caffeic Acid – Caffeic acid may be of help in preventing colitis, cardiovascular diseases, inflammation and also certain cancers. It also increases immunity. Chia seeds are advertised as good source of Omega 3 fatty acids, but it is important to know the underlying facts. It is true that Chia seeds contain more omegas 3 than salmon fish. But amongst the different types of omega 3 fatty acids, chia seeds provide ALA (Alpha Linolenic Acid). Ala has to be converted to its active form to be of use to us. However humans are inefficient in converting these acids in to active form. And hence their consumption would hardly make any difference or benefit us. If you are looking to supplement omega 3 in your diet, you could rather choose flax seeds. Now that we have all the facts and health benefits of chia seeds laid straight, we might as well use it to our benefit. can you pls let me know what are Chia seeds called in Hindi and best way to consume them. it is called sabja seeds . you can have them soaked in milk or milkshakes or in smoothies . you can also have it soaked in plain water , but it doesnt taste good that way . so i tried soaking them in lemon sharbet and it does the trick. My husband is 29years old and working with LinkedIn as a software engineer.He is a diabetic patient. He is having diabetes since DEC 14.Can you provide meva proper diet plan for him and exercises if any.